Saving lives in Uganda, one heart at a time. An interview with Dr. Charles Lugero. We sat down recently with Dr. Charles Lugero from Uganda to chat about his training here in Hamilton. Joining us was Dr. Nicholas Valettas, doctor Lugero’s clinical supervisor. Here is the transcript of our interview. Continue reading Saving lives in Uganda, one heart at a time. An interview with Dr. Charles Lugero. Dr. Charles Lugero came to Hamilton, Ontario from Uganda in 2016 with the International Outreach Program of St. Joseph’s Health System. His 12-month Clinical Fellowship in cardiology at McMaster University and Hamilton General Hospital will give him the academic knowledge and clinical skills he needs to save lives back in Uganda. He will also teach medical students and doctors what he has learned. Dr. John Mundaka will deliver babies safely back in Uganda thanks to donors who brought him to Canada for training at Niagara Health and McMaster University. This video is closed captioned. Click the CC icon in the bottom right corner of the video to display the captions. Dr. John Mundaka is visiting Niagara Health in St. Catharines, Ontario with the International Outreach Program for an elective in obstetrics and gynecology. On his return to Uganda, Dr. Mundaka will put into practice what he has learned, and pass on knowledge and clinical skills to fellow residents at Makerere University, Kampala. Women and children will benefit from the skills he learns at McMaster University and Niagara Health, thanks to the donors whose gifts brought Dr. Mundaka to Canada for medical training. Dr. Joshua Ssebuliba, Ugandan OB GYN Resident, Niagara 2016 with International Outreach Program. This is what donating a doctor looks like — a life saved. This is what donating a doctor looks like — a life saved. Doctor Anthony Batte, right, inserts a catheter so that a child can receive life-saving kidney dialysis. This child, who is in critical condition, will live thanks to the training that Dr. Batte received in Hamilton, Canada, when he studied here with the International Outreach Program. Dr. Batte spent a year at McMaster University and area hospitals learning pediatric nephrology. Now, back home in Kampala, Uganda, Dr. Batte is putting his academic knowledge and new clinical skills to work. saving the lives of children who have kidney failure. That’s the power of donating a doctor. Dr. Harriet Nankabirwa from Uganda visits with one of her patients at St. Joseph’s Healthcare Hamilton while her supervisor, Dr. Joye St. Onge, looks on. 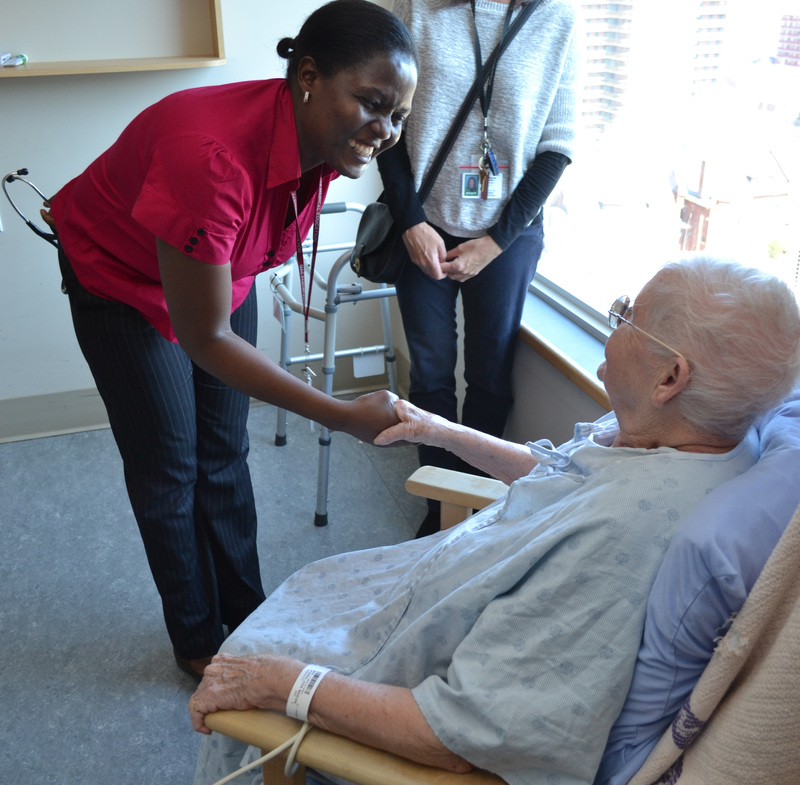 Dr. Harriet Nankabirwa is visiting Hamilton from Uganda through the International Outreach Program, doing a clinical fellowship in geriatric medicine. We sat down with Dr. Nankabirwa and her clinical supervisor, Dr. Joye St. Onge, for a chat. Dr. Joye St. Onge is Associate Professor, Division of Geriatric Medicine, Department of Medicine, Faculty of Health Sciences, McMaster University. She is also the Geriatric Medicine Residency Program Director.